Being born on New Year’s Day usually means that people are sleeping off the festivities from New Year’s Eve. January first doesn’t lend itself to typical birthday celebrations. I was fully prepared to mark my birthday with a cupcake and a few friends at brunch, but an article in The New York Times changed my mind. The article, a story about teen mothers, touched me for two reasons: I used to work at the NYTimes and I live in Brooklyn. I had no idea that young mothers in the area faced such high levels of discrimination, frustration and alienation. Was there something I could do to help? It turned out there was. Being a supporter of the most positive elements of Hip-Hop culture afford me a special relationship with notable Brooklyn DJs and producers, one of whom was adamant that I celebrate my birthday in a bigger way than just a lonely cupcake. I had declined the offer but, upon digesting the article, called up the deejays. “Would you still be open to throwing me that birthday party?” I asked. I explained my concerns regarding young mothers in Brooklyn and asked if I could turn my birthday into a fundraiser. 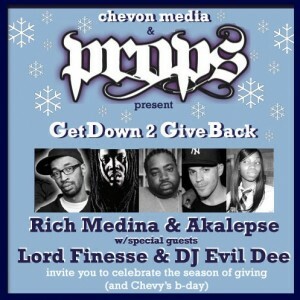 DJ Akalepse, DJ Evil Dee, Lord Finesse and Rich Medina gave me free reign. I was responsible for the conception, publicity and production of an event to benefit The Brooklyn Young Mothers Collective and I am pleased to say we raised funds and awareness of the struggle that young mother’s in Brooklyn face. It was one of the most fulfilling events I’ve put together so far.